Come and discover the peaceful tranquility of this mountaintop retreat, nestled on a 5 acre plateau high in the mountains, centered in the middle of surrounding attractions and shops in Historic Hendersonville, Black Mountain and Asheville where the Biltmore Home is located. Enjoy your get-away with family, friends or just the two of you in the serenity of the mountains with nature and wildlife where you may catch a glimpse of deer, eagles and red tail hawks. Explore the many trails and scenic views Western NC has to offer. Take a drive on the Blue Ridge Parkway and view as far as the eye can see the most beautiful mountains east of the Mississippi . Wild turkeys, deer, bear & bobcat still roam the rolling hills on top of Bald Mountain. Or you may select to stay in seclusion with your own private 5 acres and fish in the 2 acre spring-fed lake, Enjoy the screened porch and deck in this 2400 plus square foot living area with central air and heat. You may choose to retreat down the mountain to Lake Lure and Chimney Rock Park or to soothe your soul on the Rocky Broad River, which has some of the best fly-fishing in the Mountains. Ideal for family retreats or a romantic get-away. I was raised in the country outside of Palmerton, PA. My wife grew up in Morris Plains, NJ. We met at work in the mid 80’s and married shortly afterward. We moved to the Orlando, FL area in the late 80’s and lived there for approximately 20 years. While in Florida we had two children – Jessi & Alex. Jessi loves anything and everything about horses and Alex enjoys living the big city life (lived in NYC after college and now lives in Boston). In 2006 we moved to the Raleigh, NC area and shortly afterward fell in love with the Asheville, NC area. We decided we would someday retire in this area. While Florida offered warm weather, many attractions and beautiful beaches – we missed the mountains. A friend owned a cabin in the Smokey Mountains in Blairsville, GA. We vacationed there often and enjoyed the hikes, views and country air. Eventually work led us to Raleigh, NC. We vacationed in the Asheville area and immediately fell in love with the beauty of the mountains. We decided we wanted to purchase an early retirement home in the area. It took three years and many miles of driving but we finally found the house we knew we would call home. It happened to be Linger Lake Lodge. Private and peaceful setting overlooking a 2 acre stocked lake. Two streams on the property, an apple orchard and lots of open area for children to play. Approximately 15 minutes from Chimney Rock and Lake Lure. The shops of Hendersonville and Black Mountain are approximately 25 minutes. The city of Asheville is approximately 40 minutes from our home. toilet, Loft access thru upstairs bathroom or secured ladder. 3-1/2 Baths - 1 on Den side in Master BR-Tub/Shower, 1 Upstairs on Den side-Tub/Shower, 1 on Kitchen side-Shower and 1/2 in Loft toilet & sink. 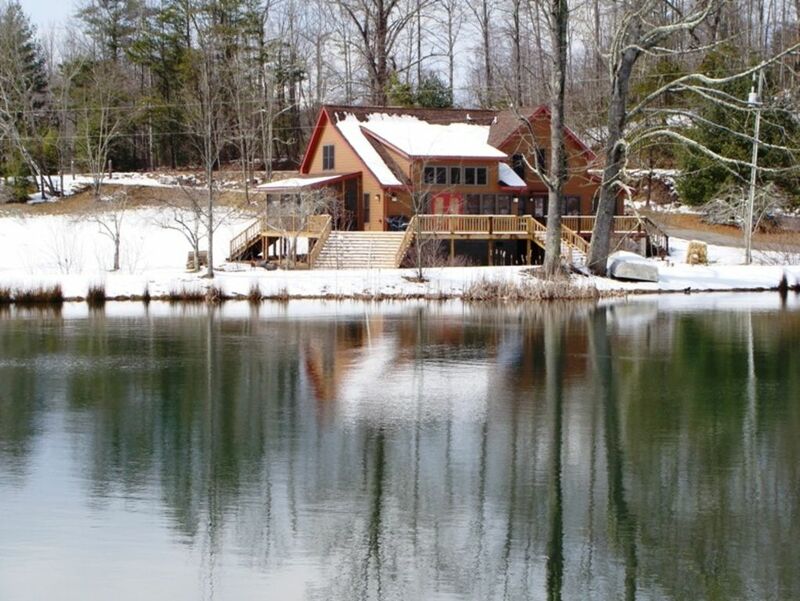 House is located on property with 2 acre lake stocked with largemouth bass and bluegills. There are Bed & Bath Linens located in each bedroom and bath. There is an outdoor burn pit but guests must provide their own wood and contact owner before any fires are started to confirm there are no burn bans in place. Additional freezer located in the laundry room. HDTV Flat Screen TV located in family room. Flat Screen TV's also located in upstairs bedroom and area between kitchen and dining room. BluRay available for all TV's in house. Approximately 40 DVD's rated PG and PG-13 available in the house. Large wrap-around deck with covered screen area off den & master bedroom. Extra Guest Fee: $10/night/person for greater than 8 guests. Property with 5+ acres, lake and mountain streams is nestled on plateau 2 miles up mountain centered in the middle of surrounding attractions in Asheville, Hendersonville, Black Mountain, Bat Cave, Chimney Rock and Lake Lure. Enjoy your get-away in the serenity of the mountains, nature and wildlife (deer-eagles-red tail hawks and more) with family, friends or just the two of you. Explore the many trails and scenic views Western NC has to offer or take a drive on the Blue Ridge Parkway and view as far as the eye can see the most beautiful mountains east of the Mississippi. Bring your cell phones...good reception Verizon & most others. WiFi internet available FOR E-MAIL AND WEB BROWSING ONLY...ABSOLUTLY - NO STREAMING VIDEO -NO MUSIC DOWNLOADING & NO ONLINE GAMING. Well-appointed house with recent upgrades. Nice big patch of land for the kids to play. Close enough to Hendersonville to get things. Proximity to Lake Lure and Chimney Rock is a stone's throw. Yet, you feel like you've gone back into time livin' out in the country. Great place and great hosts! Our family had an amazing time. The house is wonderful and comfortably fit our large family. The property is beautiful and the owners are great to work with. Well maintained property in a beautiful setting. All the conveniences of home enjoyed in a picturesque mountain location. The lake and creek complement the beauty of the property and the cool autumn air made it a trip to remember. Very nice house in a great location. We had a wonderful time enjoying the surrounding area. The house is located in a quiet and peaceful mountain area. Our family (5 adults + 2 kids) had a fantastic time at Linger Lake Lodge, and it was the perfect getaway spot for our family vacation. The house was spacious, beautiful, well organized, and clean, and the property (including a stream, lake, large yard, and outdoor fire pit) was terrific. We had plenty of room for family gatherings (e.g., meals, board games), but also plenty of privacy. I was initially worried that the house might be too remote. However, it was actually very close to Chimney Rock State Park and Lake Lure. Asheville also was very accessible via US-74A (approximately 45 minutes to downtown and 40 minutes to eastern edge). A large grocery store and gas station were conveniently located nearby in Lake Lure, too. Another initial concern was limited Internet connectivity. Although the house does have satellite Internet (which cannot support streaming video or music), the owners more than make up for this by providing three separate large-screen TVs with Direct TV and 40-50 A-list DVD movies. We could have spent our entire vacation in front of the TV and would not have run out of quality movies/shows to watch. Bottom line: Absolutely no complaints, and plenty of praise. Linger Lake Lodge was a winning choice, and we would definitely stay here again. I recommend this lodge for a large family and a great getaway ! Just wonderful and my family loved the spacious home. Everything we needed for cooking was in place. My grand kids and family loved the fire pit. We are glad you enjoyed your stay. Hope to see you back again! Nestled in the heart of the Blue Ridge Mountains, 23 miles from Asheville, NC where the Biltmore Home is, 16 miles from Historic Hendersonville, 6 miles from famous Lake Lure and Chimney Rock Park, 21 miles from the entrance to the Blue Ridge Parkway and 17 miles from Historic Black Mountain where all the shops are. EXTRA GUEST FEE: $10/night/person for greater than 8 guests Please tell us a little about yourselves and other guests included during your reservation request in order to better understand if our house and property is the right choice to meet your needs. RATES: (3 night minimal stay) Weekday $259/night (Mon-Thurs) Weekend $279/night (Fri-Sun) Weekly $1673 = $239/night CLEANING FEE: $150 TAX: 11.75% REFUNDABLE SECURITY DEPOSIT: $200 The Rental Agreement must be completed/signed and returned to owners for review/screening before final determination of reservation acceptance or cancellation. The review/screening process typically will be performed within 24 hours.